Booking method: the credit card represents only a guarantee that the reservation is confirmed. In case of a „No-Show“ the resources for one service/night will be booked. Nestled in the heart of Julian alps in Bohinj glacial valley, on the brink of Triglav national park, you will find Slovenia's premier alpine eco resort with its superb Aquapark features (sauna park, pools, slides, whirlpools), open fireplace lobby bar, capacities for socialising, bowling centre, cinema hall and an exquisite culinary offer. Excelling in its support services Hotel provides 8 different sized conference halls that accept up to 200 guests. It is a perfect starting point for summer and winter sports activities: bycicle or hiking trips, climbing, river rafting, adrenalin park experience, skiing and more. Blending harmoniously with the environment, the resort was built with highest awareness of the environment and is as such, at the moment, one of the most advanced and energy efficient hotels in central Europe. Bohinj Park ECO Hotel is the 1st Slovenian ecological hotel and it is certified by Green Globe international sustainable tourism society. Hotel offers 102 rooms: presidential apartment, luxurious apartments, suites (business, panoramic, family, newlyweds), family, standard and executive rooms. All rooms in Bohinj Park Hotel are designed with warm natural materials and high standard equipment and offer a magnificant view towards Julian Alps. 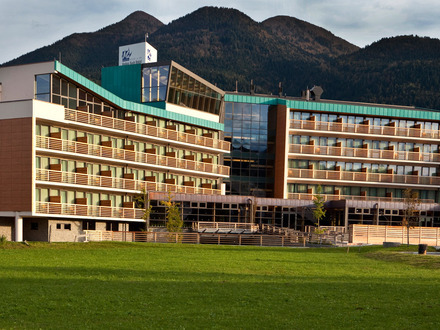 Bohinj Park EKO Hotel. Hotel Bohinj.